Kristine Snyder began her musical career playing piano at the age of 5. Being raised in a musical family, her older sister was already an accomplished harpist when Kristine followed suit and joined the harp world. She is classically trained although the discovery and purchase of her first electric/acoustic pedal harp brought a whole new dimension to harp music. Her electric/acoustic harps with individual microphone pick-ups (one for each string), provide both volume and the resonance needed to play jazz, contemporary, and rock music, compositions not usually associated with the harp's angelic reputation. At the same time, classical music becomes richer with the additional resonance and beautiful tone of her harps, a sound that amplified acoustic harps cannot achieve. This is especially important for outdoor settings where wind and waves compete with the music. On Maui, Kristine is the first choice of harpists for The Ritz-Carlton, Kapalua, The Fairmont Kea Lani, Sheraton Maui Resort & Spa, Royal Lahaina Resort, and many private companies and agencies. In addition to weddings, she plays regularly in hotels and restaurants, both as a soloist or with other instruments such as violin, flute, cello, bass, and drums. 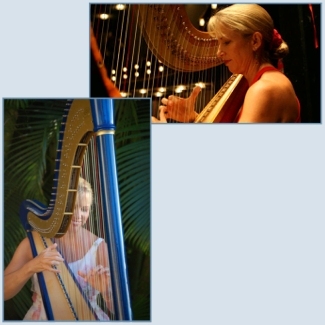 Kristine is the principal harpist in Maui’s two symphonies, the Maui Pops Orchestra and Haleakala Symphony. She has also performed and recorded with other orchestras, symphonies, gospel, and Hawaiian groups. “My love of music is clearly evident in my playing and my goal is to make your favorite songs come alive.